Remember the classic boardwalk games like skee-ball and knock ‘em over? Now you can have them right in the palm of your hands! Ramp Champ is a new iPhone / iPod Touch game that adds an interesting twist to these classics. You can journey deep into the ocean, battle space aliens, play with dolphins and unicorns, fight ninjas, and so much more in this exciting new game. Ramp Champ comes with four built-in skee-ball-like ramps. For each ramp, you are given 9 balls to roll. The object of the game is to knock down various objects (clowns, aliens, ninjas, etc.). Each object is worth a certain number of points. Aim for a high score and rack up points for tickets. 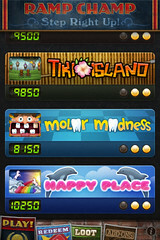 Test your finger-rolling skills and redeem your tickets for virtual trinkets. As mentioned, Ramp Champ comes with four themed ramps — Clown Town, Breakwater Bay, Space Swarm, The Icon Garden. Clown Town is like the classic “Knock ‘em Down” carnival game where you throw balls at clowns, cans, and ducks. Breakwater Bay brings you close to the ocean floor where you can see seahorses, clams, and sharks. Space Swarm has the feel of Space Invaders, and The Icon Garden has the feel of your favorite old school Mac icons. After collecting your tickets, click on “Redeem” at the bottom and pick an item that you like. Note, you will have one page with 9 trinkets for each ramp you have. Select an item by tapping on it and then tap “Redeem.” This will add your new item to your loot! To view all of your goodies, click on “Loot” and you will see shelves with all of your virtual trinkets. Tap on “Trophies” on the top right and you’ll see the shelves with all of your trophies. IconFactory (the makers of Twitterific) and DSMediaLabs did an amazing job with Ramp Champ. The selection of music puts you in the mood to get some cotton candy and head down to the county fair. And as you change ramps, the music just takes you into the specific scene. The attention to details is quite remarkable as well. The scuffs on some of the ramps were just brilliant, as well as the animation of the tickets rolling out. Ramp Champ is a highly enjoyable game that’s fun, challenging, yet easy to learn. The user interface is simply beautiful. It will surely put a smile on your face every time you play it. iPhone OS 3.0 is required to play Ramp Champ, and you may purchase it in the iTunes App store for $1.99. This article was originally posted in iProng Magazine. Many thanks to Hollywood Mac Guru for introducing me to this game! Below are Ramp Champ Video game previews by Touch Arcade. You can see how addictive the game can be!